Destinn’s personality inspired poets, writers, painters, sculptors and composers. Among the latter, Strauss, Leoncavallo and Puccini all wrote operas for her. Noted Bohemians who composed for her included Vítìzslav Novák, Jindøich Jindøich and Karel Kovaøovic. She also wrote music herself. During her student years she had composed the waltz That First Love, which became quite popular and was published – achieving four editions. 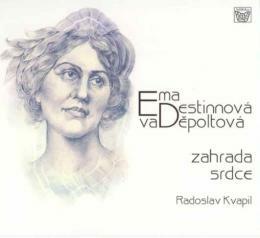 Another of her songs was introduced as an encore for her very first concert at the Prague Rudolfinum on January 2, 1900 when she appeared for the first and only time with the phenomenal Czech violinist Jan Kubelík. The world famous Czech soprano Emmy Destinn (February 26th, 1878, Prague – January 28th, 1930, Budweis) spent twelve seasons at the Court Opera in Berlin, nine seasons at the Met, two seasons at Bayreuth and was the leading primadonna at London’s Covent Garden for 12 years, where, from 1904 to 1919 (excluding the four war years), she made 225 appearances in an extremely varied repertoire including 18 operas. She also received enthusiastic receptions in Paris, Leipzig, Munich, Zurich, Hamburg, Prague, Vienna and Budapest. Destinn’s experiences as a young violinist, aspiring poet, playwrite and drama student underpinned her extraordinary vocal gifts. These, coupled with an exceptional capacity for hard work, inevitably ensured that she made an impression on the operatic stage. Undoubtedly she was one of the most celebrated and appreciated artists at a time when her colleagues included such luminaries as Caruso, Scotti, Eames, Fremstad, Nordica and Melba. She had a wide range of roles due to her considerable talents. She was a renowned interpreter of leading operatic roles from Mozart to Puccini, Verdi, Wagner, Smetana, Dvoøák and Strauss. Despite her great success in opera, it was Destinn's close relationship with poetry that endowed her with a special love for Lieder. In her youth she admired songs by Grieg, Tchaikovsky, Kienzl and Dvoøák, and gave dozens of recitals featuring them, as well as the more standard Lieder repertoire of Schubert and Schumann. With such a plethora of gifts, it is hardly surprising to learn that she also translated selected Lieder into Czech for two printed sheet editions, and two Czech opera libretti into German. She even wrote several original libretti. Furthermore, she was active in writing novels, commemorations and historical sagas. During World War I she was interned at her castle in Stráž nad Nežárkou in South Bohemia, which presented further opportunities for composing Lieder. She was captivated by the poems of Adolf Wenig (1874-1940) husband of her cousin Pavla, and wrote settings for several of these. His themes were similar to those of her own poetry from earlier years, namely Verklungene Lieder (Fading Songs), from the first part of her book of poems Sturm und Ruhe (Storm and Calm). “Emmy Destinn influenced thousands of people through her voice. Thanks to early recording techniques we, too, are able to enjoy the shimmering sound of that irresistibly beautiful instrument. But Destinn also left direct glimpses into her heart which can be divined from the twelve songs composed for poems or translations by Adolf Wenig. The mainly amorous mood of Wenig’s verses resonated powerfully with her own emotions and, together with some external impressions, formed the direct inspiration for these songs. Editor Mojmír Urbánek who issued the printed score for Garden of the Heart in 1919, Destinn’s great fame, assured the temporary success, particularly of those songs she used to sing at her concerts. Her own interpretation of one third of this cycle on gramophone records should be mentioned. If we compare her singing with the printed score, we can see and hear an evident rhythmic freedom, suggested by the text, which she used to make the words more effective and vivid (cf., e. g., the words “Umírám, umírám...” / I’m dying… in No. 8 Romance).